The Daytona 500 was postponed Sunday for the first time in its 54-year history after heavy rain soaked Daytona International Speedway. 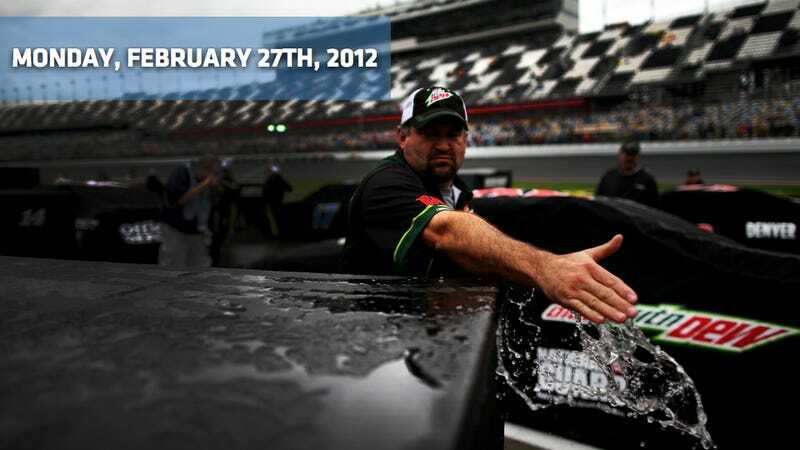 NASCAR officials spent more than four hours waiting for a window to dry the famed track, but it never came. When the latest storm cell passed over the speedway around 5 p.m., they had little choice but to call the race. The 500-mile quadruple-left-turn was rescheduled for noon today and will still be aired on Fox. But Monday might be another test as the forecast calls for more rain, but officials are prepared to wait it out all day and into the night to avoid a Tuesday race, which would be almost impossible for teams that must get to Phoenix for next week's race. Visiting the rained-out Daytona 500, Republican presidential hopeful Mitt Romney again showed his "man of the motoring people" bonafides. The man-from-La-Michigan, responding to a question of how closely he follows the sport, acknowledged that he isn't necessarily a hard-core fan but has a working knowledge of the sport and friendships with some of the people involved in racing. "Not as closely as some of the most ardent fans," Romney said. "But I have some great friends that are NASCAR team owners." But of course you do. Two days away from seeing the sheet ripped off the top of Ferrari's latest supercar — the Ferrari F620 GT — the prancing stallion brand's released a new teaser video. And here it is. Oh, and if you want to know what the car actually looks like — here's the first photo. Bloomberg reports that the Chinese government excluded foreign brands from a preliminary list of 412 models approved for official-vehicle purchases by state agencies. Yes, this year any auto purchases will be limited to Chinese brands, according to the Ministry of Industry and Information Technology. The move will help local brands gain in the government fleet's $12.7 billion market at the expense of foreign carmakers such as Volkswagen, General Motors and Toyota, China International Capital Corp. said in a report today. "This signals strong government determination to cultivate China's own auto industry," analysts led by Zheng Dong wrote in the CICC report. "Government support of local brands is greater than expected, even though rumors about the policy were many in the past several months." Although this isn't an unheard-of decision by a government — it's something we do here in the U.S. — I do find it funny that the official name of the department in charge of purchases for the government — something here called the "Office of Management and Budget" is called the "Ministry of Industry" in China. At least they don't hide the role of government in propping up native automaker sales. Motor Authority reports this morning that Nissan is the latest to hop on the common architecture bandwagon, announcing today a new Common Module Family (CMF) that will underpin a range of new cars coming onto the market from 2013 onwards. Does this mean that if they build anything more off the FM platform — an acronym short for front-midship — it'll be called the "CFM" platform? Because that acronym might mean other things. The shot to the left and up top from Autocar are the first official, undisguised pictures of the Jaguar XF Sportbrake, leaked online ahead of next month's Geneva Motor Show. The leaked photographs appear to be scanned from a brochure and show the XF Sportbrake's window line, boot-lip spoiler and the same disguised C-pillar treatment as the Jaguar XJ. The rear light arrangement — and the front from the B-pillar forward, of course — look to be carried over from the sedan.